Welcome to the newsroom. Here you'll find articles, resources and links to our newsletter. Tulsa World - Gary Percefull, often found with a helmet strapped to his head and a crew of kids riding behind him, has no regrets about trading in his school board seat for a bike seat. Tulsa Public Schools’ longtime District 1 representative decided against pursuing a fifth term this year, instead choosing to focus more on volunteer work. (Story continued on tulsaworld.com). *Gary Percefull is a long-time Anytown Leadership Institute volunteer. *OCCJ is one of the organizers of the Annual Interfaith Knippa Lecture. 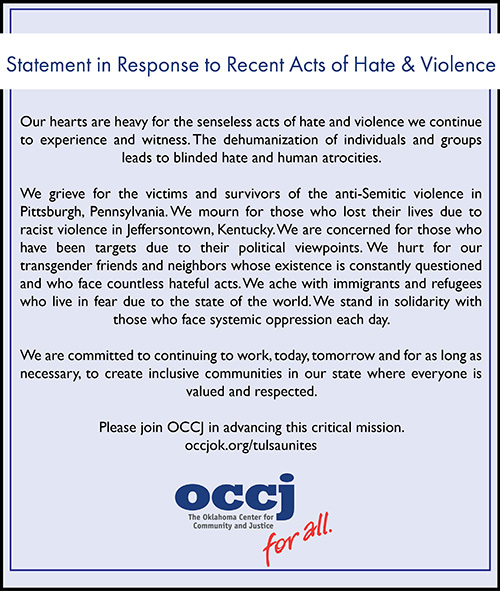 Tulsa World - Moises Echeverria, president and CEO of the Oklahoma Center for Community and Justice, said in a statement that the organization stands in solidarity with Jewish communities in Tulsa and Oklahoma. 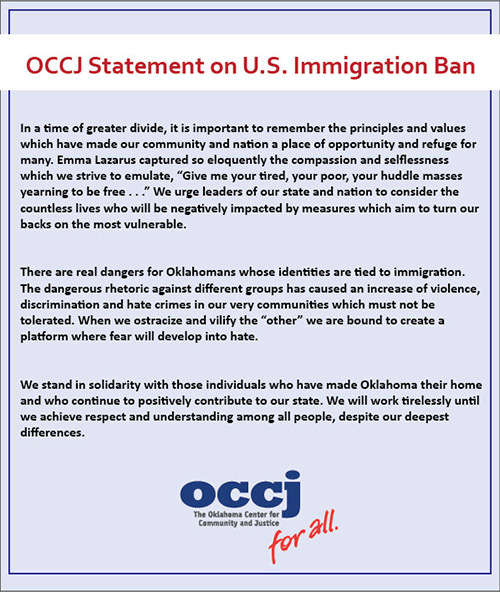 KTUL Channel 8 - Sarah Rana is with the Oklahoma Center for Community and Justice. She said we should all report or respond to a problem as soon as possible. Rana said, “Instead of getting upset and walking off, I have turned that into an educational moment and tell people these are the facts or this is how you made me feel and actually have a conversation. Or we won't get anywhere." Tulsa World - Officials of National Merit Scholarship Corp. this week announced about 16,000 semifinalists in the 64th annual National Merit Scholarship Program, including 72 from northeast Oklahoma. *Anytown Alumni Anna Byrd, McKenna Raley and Iyan Smith Williams were named National Merit Program semifinalists for 2019. The Oklahoma Center for Community and Justice was named the Outstanding Diversity and Inclusion Award winner for 2018 Philanthropy Day by the Association of Fundraising Professionals of Eastern Oklahoma Chapter. *OCCJ President and CEO, Moises Echeverria, is a member of Leadership Oklahoma Class 32. Tulsa World - Guardiola was nominated to attend Initiatives of Change, an international forum in Caux, Switzerland, that convenes about 1,500 participants from civil society, government and business. Run by the United Nations Economic and Social Council, the forum aims “to build a just, sustainable and peaceful world,” according to its website. *Officer Guardiola, featured in this article, is a member of the OCCJ Board of Directors. News on 6 - Applications are open for this year's Anytown Leadership camp. This year's summer camp has a new name and new location. Tulsa Business and Legal News - Four volunteers from Tulsa-area organizations were among those honored during Leadership Oklahoma’s seventh annual Helping Oklahoma Recognition Program. Adrienne Watt Nesser, director of the Oklahoma Center for Community and Justice; Molly Jarvis with Big Brothers Big Sisters Tulsa; Brian West with Mental Health Association Oklahoma and Hayley Rose with Susan G. Komen Tulsa were among those nominated for awards. GTR Newspapers - Since 2010, GTR Newspapers has annually offered a series to highlight individuals who are predicted to be newsmakers in the coming year. The Oklahoma Center for Community and Justice (OCCJ) will honor Sam Presti, Executive Vice President and General Manager of the Oklahoma City Thunder, at the 2016 Humanitarian Awards Dinner to be held at the Skirvin Hilton on Tuesday, Sept. 6, 2016. Moises Echeverria, the new interim president and chief executive officer of the Oklahoma Center for Community and Justice, is at the helm of an organization that he says changed his life when he was a shy student at East Central High School who spoke broken English. They are called buddy benches, and they will soon be turning up on playgrounds of area elementary schools. Nabholz Construction’s Shane Fernandez will discuss how ethics and diversity drive innovation during the next Oklahoma Business Ethics Consortium (OK Ethics) luncheon on March 24. As Baltimore rages and Ferguson, Missouri, struggles to recover, Tulsa has survived the type of anger leading communities to ashes. J.D. Wessinger, featured in this article, is a Camp Anytown alum.